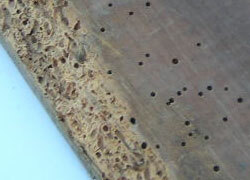 Anobium borer only attack softwood timbers, and since the majority of structural timbers are hardwood, structural damage is limited. Treatment options: include contacting Exopest for advice on treating softwood timbers, sub floor borer inspection, replacing severely infested damaged timbers with hardwood, increasing under floor ventilation and reducing moisture and dampness in subfloor spaces. 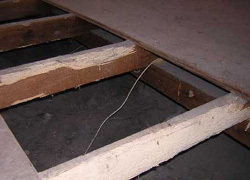 Treatments include surface application using Boracol 200H or Perigen 500 to effected timbers. Ideally both sides of the infested timber are treated for optimal control. 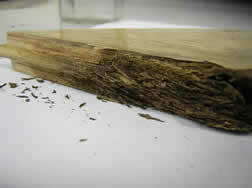 Lyctus borer damage is often found on the edge of timber framing, skirtings and architraves. 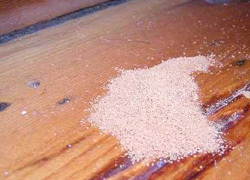 The holes are pinhole size (very small) and the powder (frass) is very fine, almost like a timber coloured talcum powder. This borer rarely attacks pines but is commonly found during renovations when wall framing is exposed, often by the electrician when re-wiring in the roof space; in timber tile battens when replacing roofs or lifting roof tiles, and in subfloor timbers such as floor bearers and floor joists when restumping. Exopest follows the CSIRO advice and does not recommend treatment for Lyctus borer, since the damage to timbers is generally decorative and non-structural. The borer lives off the starch in the sapwood. When the starch has all gone, so has the borer. 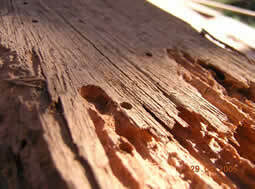 Lyctus borer mostly infest timber during the first 12 mths of its service life. More information on borers can be found on the “download fact sheet” to the left. A tree consists of a centre core of wood known as heartwood; a thinner layer known as sapwood, which is located just beneath the bark. When timber is milled, up to 25% sapwood can be present within that timber, and since 75% of the effected piece is heartwood, it remains structurally sound, free from lyctus borer and is not considered necessary to treat. This borer is found in both hardwoods and softwoods but usually only those timbers that have been affected by moisture, wood rot or fungus. The holes resemble that of a 3-inch size nail hole and are randomly spaced. The powder again is very fine but appears moist and may stick to the sides of the Borer tunnels. Case History: Exopest recently went to a house in inner city Melbourne where the sub floor timbers of one complete room had been infested and eaten out by Australian wood borer. With brick foundations to every wall and no under floor ventilation under this particular room the conditions were exactly right for the borer to reach maximum breeding potential and infested floor joists, bearers and flooring. Major structural damage occurred; all stemming from inadequate sub floor ventilation. In this case the entire sub floor timbers were removed, sub floor ventilation improvements installed (Fans and High Flow Vents) and a new floor after borer treatment with Boracol 200H. 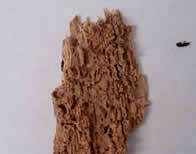 Occasionally referred to as the Decay Weevil and similar to the Australiensis borer, it attacks both softwoods and hardwoods, but only if the timbers have been affected or conducive to decay by wood rotting fungus. The holes are roughly circular and are again spasmodically spaced. The frass or powder is much finer in texture and the particles are rounder than Anobium borer. 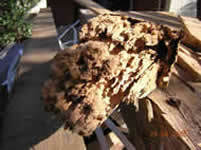 Usually it will not spread to timbers that haven’t been affected by moisture or fungal decay. Exopest recommends reducing moisture in effected areas by increasing subfloor ventilation through installing Aleta vents or solar powered ventilation fans, along with fixing pipes, improved soil drainage, lowering external soil levels and redirecting garden sprinklers and watering systems away from the edge of buildings. New timbers can be treated with Boracol 200H (timber preservative) to help protect against further fungal attack.